Rose Lane leads into the centre of the city. It runs along the edge of the area bombed in the last war. It's the edge of a new 21st Century development, called 'Whitefriars' that has replaced the post war reconstruction. Whitefriars seems to have developed into concrete canyons, with huge slab walls. 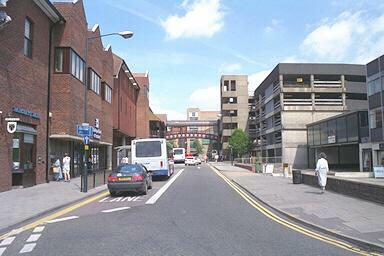 The building on the left is a new multi-storey car park which replaces the old concrete one.